Now celebrating their 34th year the Toasters are once again announcing a full calendar of dates to kick off the 2015 touring campaign. These NYC D.I.Y die-hards have already notched more than 5000 live shows and plan to heap more onto that tally this year with two North American tours, as well as dates in South America, Europe, South East Asia, Russia and points east. Formed on the lower East Side in 1981 the band has become synonymous with American 2 Tone Ska music and forged their instantly recognizable “East Side Beat” sound in such famous Big Apple dancehalls as CBGB’S where they have been named as a top 20 core artist alongside myths like the Ramones, Blondie and the Talking Heads. Widely acclaimed as launching the Third Wave Ska revival the Toasters went on to form the famous Moon Records label and kick-started the careers of dozens of bands. Their early collaborations with the iconic Joe Jackson helped define their sound and establish them as the premier USA ska act of their generation. 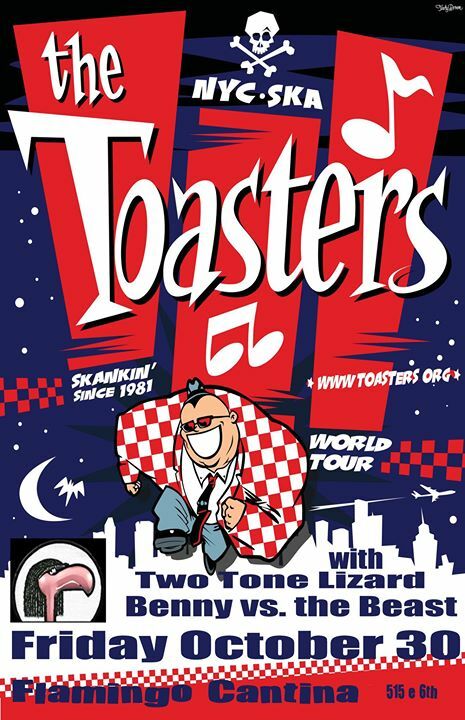 The Toasters have been hailed as “ska pioneers” (Billboard magazine) and the “sound of NYC” (New York Times). The band is currently supporting their latest single: “House of Soul”, released on their own label Megalith Records and released only in a 7 inch vinyl format. Local favorites Benny vs the Beast open; Two Tone Lizard plays middle slot. Doors open at 9:00 p.m. The Flamingo Cantina is located at 515 E. Sixth, ATX. Ages 21+ up are welcome. http://www.flamingocantina.com.